We clean all types of area rugs including wool, cotton, silk, and synthetic. Carpet Wizard has been cleaning area rugs for over 30 years! For all rugs with natural fibres, we can pick up your carpet and bring it to our shop. The shop is climate controlled and designed for the cleaning of your area rugs. Each rug is inspected before cleaning and the customer is notified if there are any concerns such as weak spots, urine, possible colour change, moth damage, etc. As much dust and dry soil as possible is removed before the cleaning. All rugs are tested for colour fastness. If there is a problem with colours transferring or bleeding, special agents are used. After cleaning, all rugs are hung to dry with fans, dehumidification and heat in place. 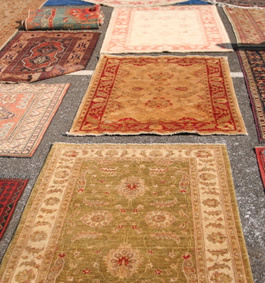 We treat all rugs brought into the shop with great care and respect because we know they are very important to you. When your carpet is ready for delivery, we will call you to determine a convenient time. From pick up to drop off it only takes 7 business days!